The late Paddy Corr holds a place as one of the greats of the game following landmark success with Glenavon. A requiem mass tomorrow (Friday) will honour the life and career of the 89-year-old former Northern Ireland B international. Enniskillen-born Corr was on the books at Coleraine and Burnley before moving to Glenavon in 1953. His time in Lurgan included treble glory across the 1956/57 season that featured the Irish League, Irish Cup and Gold Cup. In tribute, Glenavon chairman Adrian Teer described Corr as “one of the greatest ever”. “He certainly should be considered as one of the greatest ever,” said Teer. “Paddy was a fantastic player, with a great football brain. 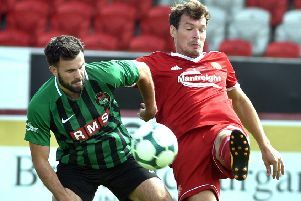 “Paddy and Wilbur Cush would be, for me, the Irish League equivalent to Spurs’ Danny Blanchflower and Dave Mackay in terms of status and ability. Corr pulled on the international jersey for Northern Ireland at B level and with the amateur side. Outside of football, Corr’s passion proved boxing and he had long-standing links with the All Saints club in Ballymena. “I remember going to interview Paddy for our club programme and he was reluctant to talk about his career,” said Teer. “He did not seek the spotlight but will be remembered as a true great for Glenavon and the Irish League. Mass will start at 10 o’clock in Ballymena’s All Saints Church before cremation at Roselawn.